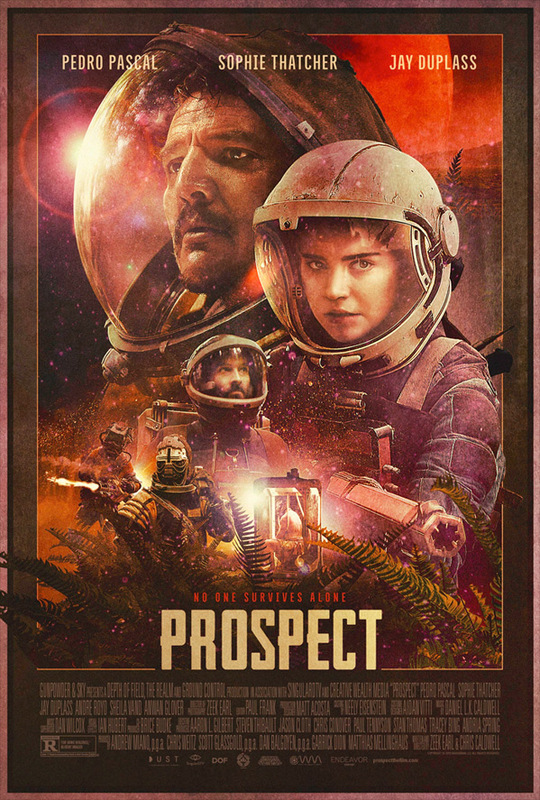 "I can offer protection…" Gunpowder & Sky has released the full-length official trailer for an indie sci-fi film titled Prospect, which first premiered at the SXSW Film Festival this year. This excellent little sci-fi set on a far away moon is a feature adaptation of a short film made by Zeek Earl & Chris Caldwell in 2014 (watch here). The film is about a teen girl and her father who travel to a remote moon on the hunt for elusive riches. They discover others hiding in the moon's toxic forest and their visit quickly devolves into a desperate fight to escape. Jay Duplass and Sophie Thatcher star, with a cast including Pedro Pascal, Andre Royo, Sheila Vand, and Anwan Glover. I had a chance to see this and it's an outstanding film that achieves so much with so little, very much worth a watch. Especially if you dig sci-fi as much as I do. Check it out below. You can still watch the first teaser trailer for Prospect released during SXSW here, to see the original intro. A teenage girl and her father travel to a remote alien moon, aiming to strike it rich. They've secured a contract to harvest a large deposit of the elusive gems hidden in the depths of the moon's toxic forest. But there are others roving the wilderness and the job quickly devolves into a fight to survive. Forced to contend not only with the forest's other ruthless inhabitants, but with her own father's greed-addled judgment, the girl finds she must carve her own path to escape. Prospect is co-written and co-directed by filmmakers Zeek Earl & Christopher Caldwell, both making their feature debut after working on a few short films previously. This is an adaptation of their own short from 2014. The film first premiered at the SXSW Film Festival earlier this year, and also played at the Seattle & San Diego Film Festivals. Gunpowder & Sky will release Prospect in all Regal theaters starting November 2nd this fall. Planning to watch this?